This video incorporates 50 mins original 16mm movie footage, and a 10 min selection of photographs, to capture a remarkable image of agricultural methods in the 1930’s. 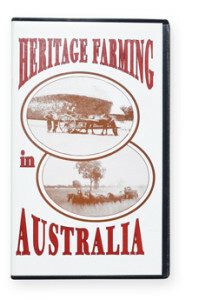 The first 10 minutes portray the development of Australian agriculture with full commentary, providing the background for the movie footage. A contrast between horse and mechanised farming methods in the Riverina is depicted in the next 30 minutes of the video. The stages of construction of a 180 ton thatched hay stack is shown in the final 20 minutes. The remarkable workmanship that goes into building the stack, and the retention of quality in the hay even after 10 years is a tribute to the pioneers of early Australian agriculture. Specifications: VHS Format B/W & Colour; PAL; Running time 60 minutes. Released in 1992 this “evergreen” has elicited admiration and amazement from thousands of viewers, both in Australia and overseas. Europe’s top selling vintage tractor magazine “Tractor & Machinery”, nominated Heritage Farming their top video for 1997, being awarded 6 stars, their highest accolade. Clydesdale Societies and enthusiasts also value the video. This wonderful video displays various methods used in planting crops and harvesting, contrasting one style to another it depicts the hard work by man and horse machine in order to feed a young nation. Like the book, this is a “must-have” for all enthusiasts in early Australian agricultural history. National Film & Sound Archives, Canberra, November 1992. “What we have here is a time capsule, a record of a vanished way of doing things. This is outstanding footage, 16mm home movie stuff we normally don’t look at, but it has the quality of the great American photographers of the 1930 and 1940’s. It has something of that documentary quality that is extraordinarily rare”.